"Etria is a continent roughly half of the size of our Australia. It contains a variety of binomes, plus bays and rivers, but the entire continent is roughly the shape of a triskelion, though the Regalo Bay area does represent an irregularity in this shape. Politically, Etria has two major kingdoms, Trinita in the south, and Inferno in the north. There is a desert in between these kingdoms known as the Badlands which is an effective No Man's Land. 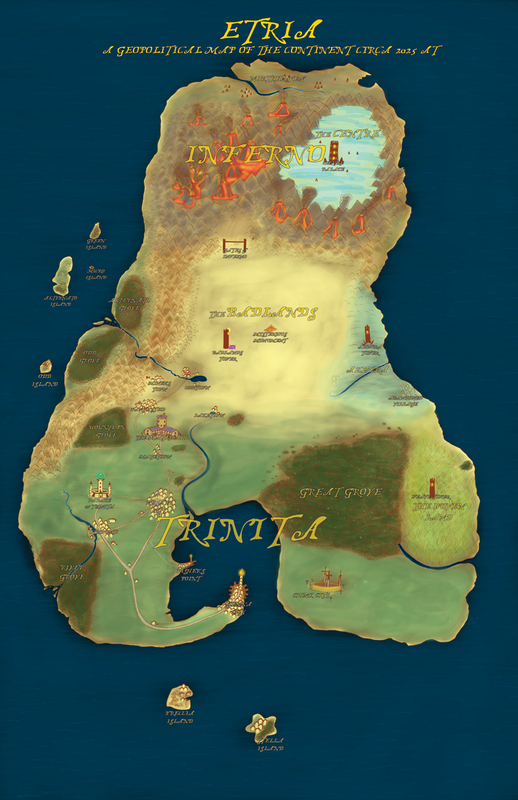 Trinita has used this natural barrier to establish peace and prosperity in their kingdom, but Inferno, saddled with the worst land in the entire continent for various reasons, usually tries to invade Trinita once every few decades or so. It never works." PS. VanCAF this weekend! Plus, if you like the comic, do give us a vote by clicking the topwebcomics button on the right! Thanks!